In our active sitting program we introduce deep breathing exercises into our working day. What does active sitting mean? The active sitting program is an exercise program that will loosen our often tight and sore muscles. The exercises will make you joints work better again by lubricating them. As well as that they will strengthen and stretch our muscles. This helps us to maintain a good posture. All exercises are done sitting on the exercise ball. 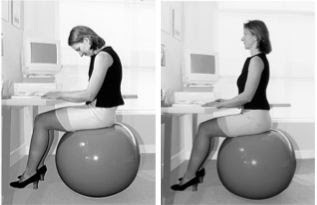 The ball on its own is a good way to keep the otherwise passive position of sitting relatively active. Many people sit for a long period of time each day. Many of us sit in work. We also sit while we take our meals. We sit when we travel. We sit while watching television or a movie. The list is long. When you add up all the hours you sit every day you might discover you sit for most of the day. Unfortunately many people slouch while they sit. Combine that with the fact that most people sit so much we soon realise that their bad sitting posture can causes them back problems. A good indicator of the state of our posture is our breathing. A posture which enables us to take a deep breath is naturally upright and straight. As we slouch our breathing becomes shallow. Our chest becomes restricted, depriving us of one of our main sources of energy. As the breathing is shallow the body accumulates high levels of carbon dioxide causing us to get tired. Internal organs can be compressed and blood flow to these organs can be restricted. As a result their functionality can be reduced. Sitting upright enables us to breath more deeply allowing our body to work more efficiently. Likewise deep breathing exercises can improve our posture. Deep breathing exercises can therefore help people with back problems, too. 1. Slowly take a deep breath and as your chest rises, feel how your thoracic vertebrae start straightening up without the conscious use of any other musculature such as your back muscles. 2. Exhale and let the shoulders, torso and chin fall down and forward a little. Repeat the exercise a few times. 3. We can enhance this simple exercise when sitting on the ball by gently rolling backward when inhaling and forward when exhaling. By rolling back and forth on the ball we mobilize the entire spine during this exercise. By simply focusing on our breathing we can thereby achieve an improvement in our sitting posture. Try to correct your posture in this way as often as possible during your working day. Allow your spine to be more upright, assuring good breathing and thereby increasing your energy levels. You can also try another variation of the above deep breathing exercise. Again make sure you sit upright before you commence the activity. 1. Place one hand on you chest. Place the other hand on your stomach. 2. Take a deep breath. Notice which of your hand rises as you breath in. Notice how your chest and/or stomach drop as you exhale. 3. On the next inhalation try to let your breath make your stomach rise. 4. On exhaling pull you stomach in and get a sense of squeezing the air out with your stomach muscles. This entry was posted in ball exercises in work, deep breathing exercises, mobility exercises, neck stretches, stretches on November 17, 2013 by flying form.